Descriptions of Bigfoot often give the impression of a part man part ape creature, coincidentally suggesting an idea of hybridization between beast and man. Researchers openly say it themselves, maybe without realizing, another possibility to its existence as a tall ape with human-like features. Hybrid beings, like Bigfoot, are found throughout the world and are actually commonplace in most cultural belief systems. Whether hybridization is between humans and animals, humans and gods, or gods and animals, ancient beliefs often touch upon these beings as those with extraordinary abilities. Likely one of the more famous examples of hybrid amalgamations is the Cynocephali, a human with the head of a dog. Egyptians worshiped them as Anubis, Set, Horus and Hapi. Greek mythology references hybrids in the appearance of many demigods such as Centaurs, Minotaurs, Medusa, Satyrs, Cupid, Harpies, and Sirens. St. Christopher is depicted with the head of a dog in Eastern Orthodox Churches; Buddhist missionary Hui-Sheng once identified an island of dog-headed men in ancient Chinese history, which some say refers to modern Japan or North America. Bastet, Egyptian goddess part human part feline, similar to lioness Wadjet-Bast. A statue carved by an unknown culture was discovered in a 2,600 year old archaeological site called Sitio Barriles, located in Panama; It appears to be half woman half frog (or bird), nursing a child showing the same hybridization. The list continues on as if several cultures around the world all witnessed the same beings, or a centralized culture maintained the belief which was then spread to other cultures as human population expanded. Cynocephali and animal hybrid mythologies are merely scratching the surface when it comes to how many hybrid human references exist in historical record alone. Researchers examining ancient accounts of human animal hybridization find it difficult to ignore striking similarities between the demigods and how they're portrayed by various ancient civilizations. 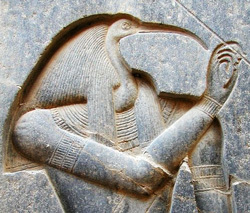 Usually these types of hybrids are depicted as a human body with the head of an animal, be it a raven or dog, prominent enough to focus a viewer's attention directly to the head.